In recent times, beacon technology and Bluetooth LE have shown great promise in the area of location-based applications. Beacons are already being used at places like malls, hotels, airports, and retail stores for achieving objectives varying from user movement tracking to event management. Beacons are being used to simplify check-in processes and to increase a company’s customer base by notifying them of various offers. And with the interest in this technology growing as ever, it is becoming more and more popular in today’s world. One space that can benefit from this technology is the workplace. As we have written about previously, we created a proof of concept application to track meeting room usage within 3Pillar offices. In this post, I will look at some of the ways in which beacons can be used in an office and the techniques used to implement them. In the first use case we looked at, we supposed that a team working on a project might decide to have an impromptu meeting to clarify some doubts. This application would help them identify which meeting rooms were not occupied, thus saving the efforts and time to walk the office in search of an empty meeting room. For this application, beacons are required to be installed in each of the meeting rooms. When an employee enters a meeting room, the data is updated at the backend. After that, the application will keep on sending the location after some fixed time-interval. In the above application, we can see the occupancy for all meeting rooms and the list of employees present in that room. This app can also be integrated with the Calendar system of the office to ensure booking of meeting rooms from the app. If anyone wants to check if all of the invitees for a meeting have arrived or not, it can also be done. The data obtained from this application can further be used to identify the meeting rooms with high or low traffic, high or low traffic hours, and the usability of meeting rooms. We can also find out the used capacity of meeting rooms, i.e. if the meeting rooms are being overly occupied or if occupancy is usually less than the capacity. In large offices, we face the problem of locating our colleagues many times. This complication can be solved by installing beacons across the office premises to figure out the exact location of any employee. This app is even more beneficial for offices with multiple buildings. Once beacons are installed in an office, the application will keep sending the details of nearest beacon to the server, which will update the location of the employee depending on the installed location of that beacon. All that employees are required to do is sign in into the app before entering the office premises and their location will keep on updating to the backend by itself. Having said that, we can further simplify tracking by reducing the efforts required of an employee, thereby improving the user experience. Instead of asking the employees to sign in to the application, companies can keep track of the device IDs of their devices. So, once an employee has registered his/her device, the employee’s movement across the office can be easily tracked. Beacon technology can also be used for updating the In-time and Out-time of employees, which will eventually help while updating timesheets. For this purpose, only one beacon would need to be installed at each of the entry and exit points, thus keeping the infrastructure-cost to a minimum. This is specifically beneficial for the companies having a very large number of employees where long queues can be avoided by using beacons. This process can also ensure collecting more accurate data in terms of employees going out of the office for breaks during office hours. Interested in reading more about beacon technology and Bluetooth LE applications? See my previous blog post on using Estimote beacons to test out the concepts covered in this blog post. Sparsh Khandelwal is a Software Engineer at 3Pillar Global. 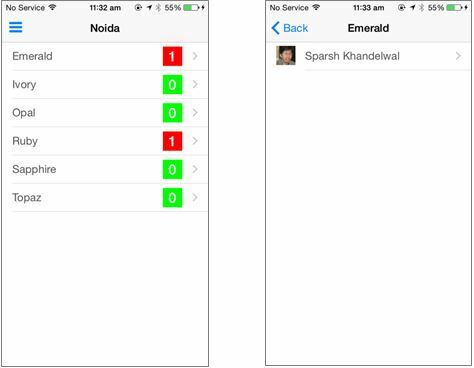 He has experience in .NET technology and iOS application development in Objective C. Sparsh is a graduate from the renowned Indian Institute of Technology (IIT), Delhi. He is an avid reader and loves to spend his time reading novels. Can you let me know the accuracy in the Employee Location Tracking? Umer, thank you for the question. The Notification sample (available for Android or iOS could be a good place to start.